The small border town of Chirk lies in the Ceiriog Valley, an area so beautiful it has been nicknamed 'little Switzerland'. 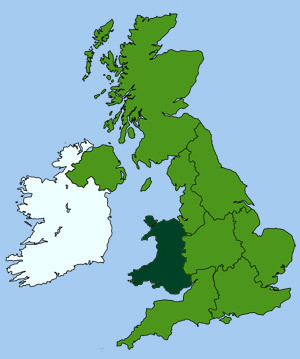 This area was the homeland for three of Wales most notable poets: Huw Morus (1662-1709), Robert Ellis (1812-1875) and John Ceiriog Hughes (1832-1887). The name Chirk is related to the English word for Church. The town's strategic location, at the point where the rivers Ceiriog and Dee meet, gave rise to a 12th-c. motte and bailey castle built by King Edward I to guard the entrance to the Ceiriog Valley. The fabric of this Welsh border castle has changed little since its construction by Edward I in 1310. Once the home of Sir Thomas Seymour, who	married Catherine Parr (Henry VIII's widow), it has been lived in almost continuously for 700 years. Set within large formal gardens containing flowering shrubs and clipped yew. The garden terrace offers magnificent views over over the Salop and Cheshire plains. Within the castle is a treasure trove of portraits, tapestries, wall hangings fine plasterwork and exceptional Adam style furniture. Open to the public and run by the National Trust. The magnificent 100 feet high stone railway viaduct at Chirk was built in 1846 by Scottish engineer Henry Robertson, to facilitate the Shrewsbury and Chester Railway. 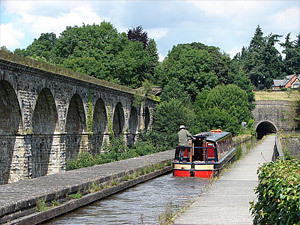 The 70 feet high adjoining aqueduct was built in 1796 by Thomas Telford and William Jessop to carry the Ellesmere Canal.